in Search Marketing with tags Accelerated Mobile Pages, Google, Google AMP, search Both comments and trackbacks are closed. Recently Google started ranking AMP (Accelerated Mobile Pages) in its mobile search results. 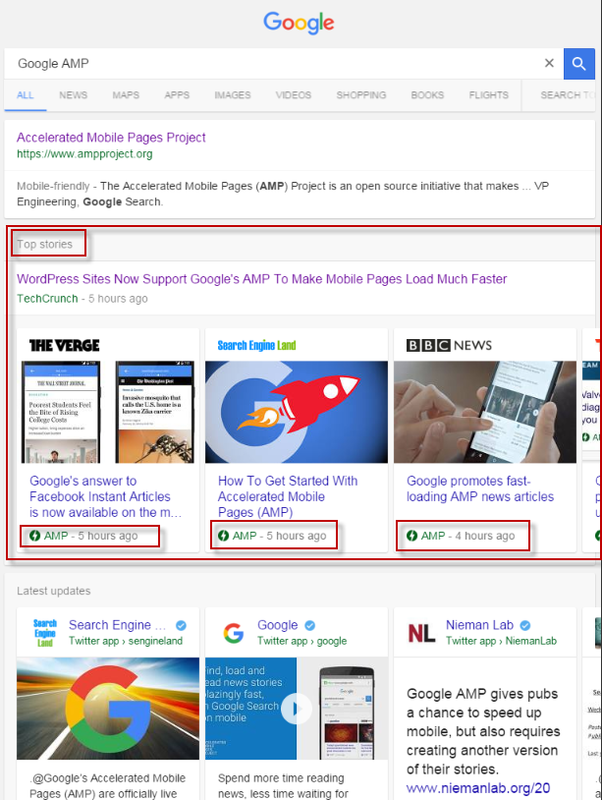 Mobile users searching with Firefox or Chrome browsers can now access these Google AMP search results and will see a carousal labeled “Top Stories” where many publishers have already deployed AMP equivalent versions of their pages for Google to index. Google is highlighting these AMP results with a green lightning bolt label because such links will load lightning fast. First hand, it will be a refreshing experience with “zero waiting” on mobile devices. Google continues to reward website visibility and publishers who improve their website page speeds, mobile UX, and faster content delivery. It’s clear that implementing high speed pages for users still poses a challenge. The data overwhelming shows how important the speed of content delivery is for consumers. In fact, 47% of consumers expect a web page to load in 2 seconds or less and 46% of smartphone users will not return to a site that performs poorly (Soasta). 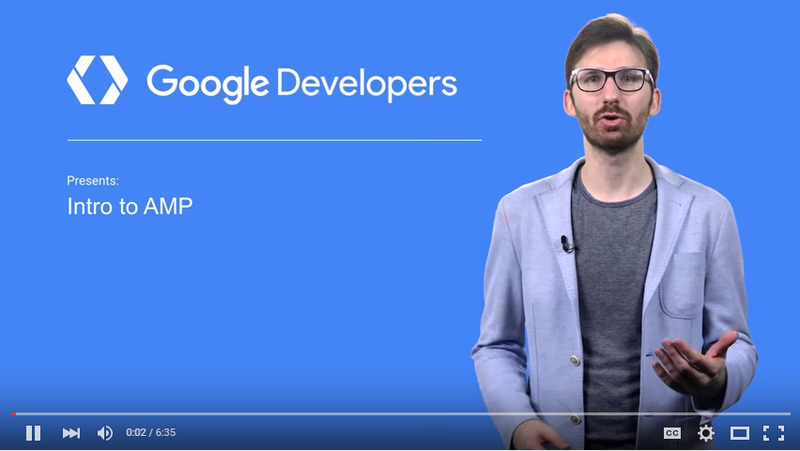 To encourage brands to speed up specific types of content, In late 2015, Google announced its support for Accelerated Mobile Pages (AMP), a new framework that speeds up specific types of webpages. This solution is an alternative and similar to Facebook’s Instant Articles, both enable article pages to load nearly instantaneously. The AMP project is in its early stages, but it’s a promising alternative for brands who publish a large volume of article pages. Now that Google is highlighting these pages in mobile results, marketers should seriously take notice and look to improve their page load speed. In this post we’ll go into more depth around what AMP is, and cover the benefits, limitations, and considerations for brand’s that are interested in speeding up their content delivery for consumers. AMP is a developer option that provides an open source framework to build web pages against static content. The solution creates a duplicate “diet” version of a webpage which Google caches to deliver high speed load times. HTML – While most tags in an AMP HTML page are regular HTML tags, some HTML tags are replaced with AMP-specific tags (see the AMP spec). CDN (Content Delivery Network) – The AMP CDN is a proxy-based CDN for delivering all valid AMP documents. It fetches AMP HTML pages, caches them, and improves page performance automatically. AMP reduces the frustration that users often experience while surfing the web, encountering a brand’s content, and then having to wait many seconds to see it render on their devices. A core goal of AMP is to bring instant-like page speed to users through open source coding techniques, empowering brands to keep control during the process. Google’s caching process is a key part of the speed delivery in Google’s search results, but as the publisher makes an update to the active page, Google’s cache will recognize these changes in a matter of seconds. No user-authored JS: Allowing arbitrary JS in the page allows for introduction of non-detectable bottlenecks, so this feature is presently disabled. Subset of tags and selectors: AMP prohibits applets, objects, forms, and external stylesheets. Only the most basic CSS selectors are available. Tracking & Monetization: By not allowing any other JS, traditional tracking isn’t possible at the outset. However developers can use the amp-pixel tag to pass data to analytics platforms manually without JS. Here is an example from The New York Times which appears to be using it on one of their amp pages. Although there is the ability to use a standardized ad format within AMP pages, in general these pages will probably be encouraged to have at most one ad/ad-view, which may not be attractive to some publishers. Other considerations: Some brands might not be keen on using Google’s CDN to speed up content delivery of their assets, becoming an in-between. Look back up at the “Entertainment Weekly” page, notice how the address bar served its content from google.com, not ew.com. Also, so stylesheets larger than 50K are allowed and there exists additional HTML tagging for SEO, providing clarity on canonical pages vs AMP alternatives. 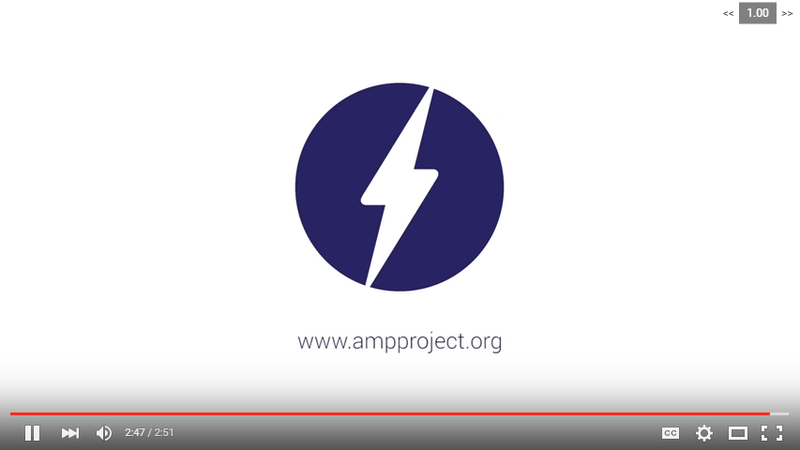 The AMP Project is still in its infancy and the future of the framework is uncertain. As Google starts rolling out AMP in its mobile results, it should already be a consideration for news outlets and brands that publish newsworthy articles. In adopting AMP, brands are very likely to get a ranking boost while improving their user experiences via pure speed. Users might even pay for those faster experiences, making pay-walls a consideration or reconsideration to monetize great content. Websites that run blogs on WordPress can quickly add a plugin to enable AMP of posts, a quick win for brands that leverage WordPress for blogging. To validate indexing and performance in Google, brands can leverage access to Search Console to validate and check for errors. Google has published guidelines for search that are a good starting point. In parallel, brands should begin working with SEO partners to gain a more comprehensive analysis of their websites’ speed in contrast to competitor site pages. Using tools like Google PageSpeed Insights is also great for benchmarking important metrics and factors that are impacting a user’s experience on site pages. SEO teams should help prioritize all pages, where AMP might be leveraged, in addition to other techniques (best practices) that developers can deploy to make content pages load quickly. Cover photo via Search Engine Land.